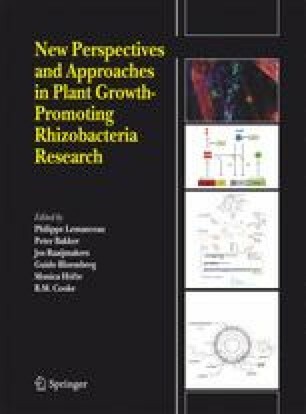 Several plant growth-promoting rhizobacteria (PGPR) have shown potential to enhance nodulation of legumes when coinoculated with Rhizobium. To optimize the efficiency of these Rhizobium-PGPR-host plant interactions, unravelling the underlying mechanisms and analyzing the influence of specific environmental conditions is crucial. In this work the effect of four PGPR strains on the symbiotic interaction between Rhizobium and common bean (Phaseolus vulgaris) was studied under deficient versus sufficient phosphorus supply. It was observed that the effect on nodulation of three out of four PGPR tested was strongly dependent on P nutrition. Further, the use of specific PGPR mutant strains indicated that bacterial indole-3-acetic-acid production (IAA) and l-aminocyclopropane-l-carboxylate (ACC) deaminase activity play an important role in the host nodulation response, particularly under low P conditions. Moreover, it was shown that the differential response to PGPR under low versus high P conditions was associated with changes in the host hormone sensitivity for nodulation induced under P deficiency. These findings contribute to the understanding of the interplay between Rhizobium, PGPR and the plant host under different environmental settings.